The Good Time Emporium’s reign of infamy is at long last coming to an end–it’s closing its doors forever this Monday, the 30th. Okay, that’s a bit melodramatic. There were many good times to be had at Good Time’s, but most Somerville-area residents were pretty torn on this establishment. People loved it for its seediness. Others hated it for just that reason. Even if you’d never been to the Good Time Emporium, chances are if you’re from around here you’ve heard of it. It’s an arcade, a pool hall and a sports bar all in one, with some laser tag, batting cages and oodles of Keno thrown in for good measure. You’d expect it to reek of cigarettes (except indoor smoking is banned in Massachusetts), especially near the compulsive gamblers camped out in the Keno areas. Combine the gaudiness of Vegas with the grit of a dive pub and you get a pretty good idea of what it’s like there. And that’s why some friends and I decided to pay it a last visit before this long-time cultural institution in Somerville is gone forever… and replaced by an IKEA. Towards the end of our visit, some of the guys found the Teenage Mutant Ninja Turtle sidescroller arcade game from when we all were kids. They all pooled their coins together and four of them started button mashing through a pretty decent number of levels. Got a video of them playing too. 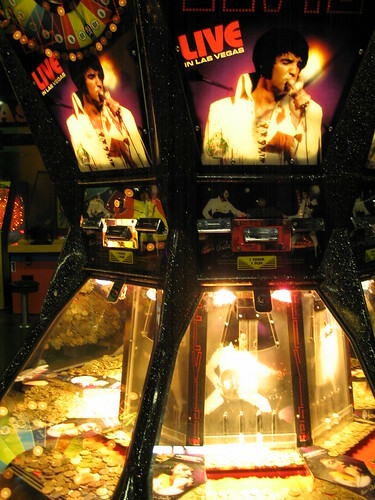 These arcade games were always so horribly unbalanced to make you lose your money as quickly as possible, it’s pretty funny hearing everyone trying to their best to not get killed. Very happily I got to jump in and take over as Donatello when one of the other players backed out. (Michaelangelo was my favorite as a kid — he was the party dude, of course!) So yes, I was a big Teenage Mutant Ninja Turtle fan when I was a kid, and it was really funny seeing that vestige of my childhood again. What a shock to see how dated April has become! It’s been ages since I’d seen a real Pac-Man too. Supposedly the IKEA will help vitalize Assembly Square and bring more jobs to the area. Supposedly the Good Time Emporium will be able to relocate somewhere else in the Boston area. Can’t really say. But as we all wait to find out what happens, I thank you, Good Time Emporium, for that lovely nostalgia trip this evening. It was wonderful to play these games I remember from when I was a kid. They still have a lot of charm. In a few years, if I find myself in Assembly Square buying some umlauted goods, it’ll be weird to think that I once played skee-ball where there’s now a Björkudden table. 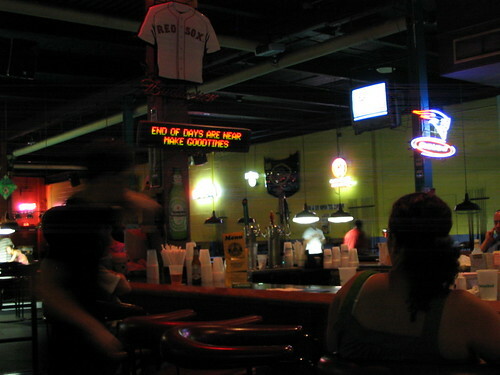 Man, I only went to Good Times once, but damn I love that place. It will be missed. BTW I totally saw you at the Scavenger Hunt. i hate to admit that i was a regular at goodtimes (no, i’m neither a 60-year-old compulsive gambler nor a kid whose parents would drop me off there from 9-close, complete with a glock for personal protection until they were done going on random dates.) the place was good times. DaMM I MiiSS DiS PlAce I’ve BiNN ThEre A lot Of TiMes AnD Wen I HeRd DaT ThEy WerE ClOeInG I Was HeAtEd BuT I HeRd DaT ThEY WeRe OpEnInG OnE In BrOcKToN OnE DaY AnD Am dEFF GoInG To Go ThErE. ThIs PlAce WiLL Be MiSSed.